Capture lectures and interviews in outstanding sound quality. The 3Mic AutoZoom+ technology suppresses surrounding noises for crisp and clear recordings. A motion sensor automatically selects the right microphone for each situation. The built-in motion sensor detects the recorder when it is placed on a desk or held and selects the microphone sensitivity to suit the recording situation preventing you from accidently blocking the audio you want to record. The pre-recording function allows you to record the last five seconds before you press the record key. The device switches into a standby mode and records a five-second loop without saving it. Press the record key to save the five-second loop. This feature allows you to sponaneously record important parts of a conversation. Capture your recordings in MP3. The popular file format allows you to play back your files virtually anywhere and simply share them with others. The large color display offers sharp images, making it easier to see and read everything at first glance. The clear user interface supports eight languages and is optimized for easy, intuitive operation. A time stamp with the date and time is added to every recording, allowing you to easily navigate through your library and find files. Finding recordings is quick and easy. The high-capacity Li-polymer battery can be easily charged through a standard micro USB jack. This guarantees extended battery life for extra-long recording ensuring that your recorder will always be ready to work when you are. Thanks to Plug and Play in Windows, Mac OS and Linux, you can quickly access your recordings without installing any additional software. The recorder is automatically displayed as a removable drive once connected to your computer via USB. It can also be used as a convenient way to store, back up and share files. Capture and store up to 88 days of continuous recording thanks to the 8 GB of internal memory. Virtually unlimited recording and storage capacity thanks to a microSD memory card slot supporting up to 32 GB of additional memory. Its robust and lightweight design maximizes comfort and the metal surface creates a robust shell around the device. 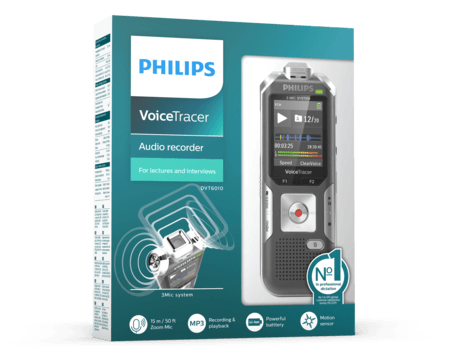 Voice-activated recording is a convenient feature for hands-free recording. When enabled, recording will start automatically when you begin speaking.Recording pauses when you stop and resumes automatically when you begin speaking again. How do I reset my VoiceTracer ?